I love soup. I mean I LOVE soup. If you’ve been around me for any amount of time you already know this. Butternut squash soup is probably my all time favorite. It’s so creamy, so rich, so satisfying and delicious. Every year when Fall arrives and the leaves begin to change colors and the air gets beautifully crisp, I can’t wait to make my first batch. Granted, it’s still 85 here and very few leaves have changed and we are headed into November, but that’s Texas for you. Sigh. A girl can dream, right? 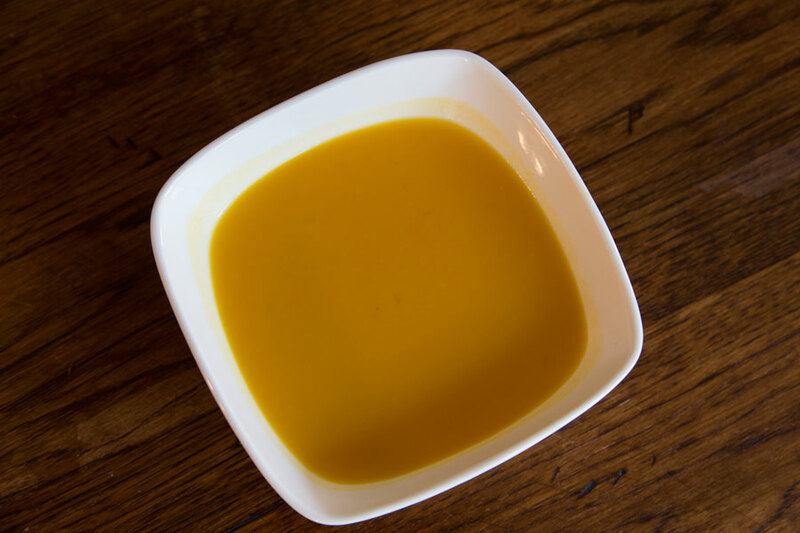 This is a simple butternut squash soup recipe. There’s nothing fancy about this soup. I don’t add spices, I don’t add cream, there are many other variations out there that you could find if you need more flare. But for me, the squash is the star and I just let it shine. Consistency is key with this soup. Depending on how you like it you’ll have to adjust the liquid for your own tastes. I prefer this soup on the creamy, thick side. I also make a big batch so there is a lot for leftovers throughout the week. Don’t be afraid of leftovers, please, they save you so much time in the kitchen. Melt the butter over med-low heat in a stock pot. Add the diced onion and let it simmer for a few minutes, then add the celery and let it all cook until the onions are soft and transparent. Meanwhile cut up the squash. Once the onions are ready, add the chopped squash to the pot and cover with the chicken stock about 1 inch above the vegetables. Keep the pot at a simmer or light boil on the stove, uncovered, until the squash is nice and soft which will be about 30 minutes, give or take. At this point you have a few choices. If you have an immersion blender, cause you have a grown-up kitchen or something, go ahead and stick it in and the blend the whole bad boy up. If you do not own fancy do dads like immersion blenders, then you’ll need to transfer the bulky part of the soup (i.e. the vegetables) into a blender with about 1 cup of the liquid or a little more if needed and watch it spin round into a beautiful oblivion. This may take a few times to get everything blended. Blend it well and then pour it back in with the rest of the broth in the stock pot. If this is too thick for you, add more stock. Now taste it. Always taste soup as you cook and add flavors and spices along the way. That’s just a free bonus tip for you today, so you can’t say I never did anything for ya. After you have tasted it start adding salt. I prefer to use this kind of salt because of its nutritional value and the fact that it will actually help keep you hydrated, it will never “puff” you up as table salt can. I start by adding 1/4-1/2 tsp of salt at a time. Stir it in, let it mix for a minute, taste and then add more. Keep going until you get it just right. Don’t rush this part. Great soup requires great patience. *Little fun side note here: I do this weird little challenge with myself when making soup. I try to see if I can season it JUST right so my husband doesn’t add extra salt at the table. It’s weird, I know, but it’s fun to me. I often win my own little made up challenge and pat myself on the back. Okay, back to the recipe. That’s really all there is to this soup. As long as you are patient while blending and seasoning and keep working at it until it’s the right consistency, you will most likely produce a delectable, rich soup that most if not everyone in your family will enjoy. Like I said, this is a super simple, basic recipe. No frills, no fuss, just soup. Once you try it, let me know what your thoughts. If you want some more soup recipes, check out my Kickin’ Tortilla Less Soup as well.